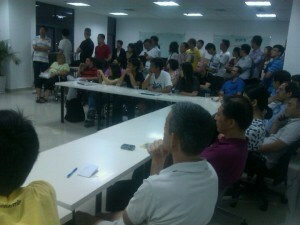 You are here: Home » Nice Turnout at Shenzhen’s First Startup Tuesday! I truly believe marketing is listening to what people want, and giving them that. If you missed the event, here are the slides from tonight – Shenzhen Team – Startups Tuesday, and I’m outlining it here. 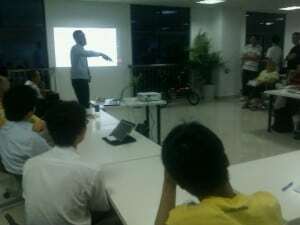 Bringing Together Shenzhen’s Startup Community! People kept asking me what is this first meetings agenda…but really, its an open meeting to explain the purpose of this club, how its different from the various Chamber of Commerce meetings, how its about being a support group for startups and new businesses. ￼￼￼￼￼￼￼￼￼￼￼￼￼￼We showed a few startups in Shenzhen that we already know of, and made an example and case that this type of startup community and hub is more than overdue! My 6 months living in Hong Kong (well, partially there, bouncing between Dongguan and Shenzhen as well) I was exposed to the boot hk coworking space, and the startups Monday meetings, pitch nights, web wednesdays….I kept saying to myself, this can happen in Shenzhen too. Why not…..there are all kinds of “general networking” events in Shenzhen….happy hours, bar nights, drinkfests, excuses for restaurants and bars to have meetings (to get more sales in their location) , we want to focus on the development of relationships, within the tech and startup world. We will host a joint HK / SZ pitch night sometime in the Autumn….and this is exciting. Also, members of SZteam will get a couple days free per month to boot hk hong kong coworking. It will build up this massive network, bridging Shenzhen and Hong Kong. We will outline all the startups we know in Shenzhen. If you want to be in this directory, please let us know after the meeting. Weekly, laid back meetings each Tuesday night here, get a speaker, either another startup or an expert in an industry to discuss a certain topic and also get to build relationships with other startups and small businesses in the shenzhen community. Maybe every 3 months, depending on the general interest in Shenzhen startups, we will invite selected startups to pitch their companies to the general public, as well as to a panel of judges. Looking for bars or other venues to host these events, any one out there? • Audience votes on the best startup. Build a startup in a weekend! In Hong Kong, startups have formed from this weekend. This weekend is especially great for those who want to make a startup, but don’t have an idea or a team. Or want to learn and experience it quickly. Again, there is great support from other startup and entrepreneur organizations in Asia, as well as around the globe. We have been active on forums, attending other events, and getting the word out. Tropical MBA – work anywhere, enjoy life! Hope to run these weekly. Meet people in Shenzhen Visitors to Shenzhen Share ideas. Seems like a wonderful turnaround. I did manage to attend a good 15 mins of the meeting on my iphone 4 via skype 3g video, but alas could not hear well enough to continue…. let’s set up a laptop with external mic next time? glad you got something out of it – we weren’t so sure how skype would work. maybe you can stop by and help us set it up these next couple days?